Where the heck is this train taking us? In our newsletter last week, there were a few sentences in there that hit us hard. We were talking about how, as farmers, we can't just spend our time thinking about how to grow the best pastures and raise the most exceptional food. Because even though this stuff is fun and important, we're also asking ourselves a bigger question of how can we can make the biggest impact and do the most good for our community. I'm not sure how that last part felt to you. You might have glossed over it. You probably didn't give it a second thought. But when we read it out loud to each other (yes we do this countless times before we press the send button), we felt so nervous. We felt nervous because we really do dream about expanding the reach of this farm and sharing our knowledge beyond this platform. Sometimes, we can literally feel the farm blowing us in this direction, encouraging us to press pause and consider what more we can be doing to make a difference for even more people. We've got a mission that lights us up every single day. We grow amazing food and help families in Rochester eat well. And, we have YOU and this incredible community of people cheering us on and supporting us at the Brighton Market and Farm Store every week. So how might our little farm and the community we're building here in Henrietta change the world? Well, we're just going to have to wait and find out the answer to that question together because we've got a lot of exciting ideas waiting in the wings, ready for the right moment to hatch. PS- Just in case you were worried, none of these wild dreams of ours involve us stopping farming! We intend to continue to raise organic livestock for the long-haul! Unlike a lot of area farmers that grow lots of different vegetable crops, we focus our energy on our livestock and just two specialty crops: ginger and turmeric. If you're wondering why we chose to grow these two plants, you are not alone. It seems pretty random. That is, until you hear the backstory. Greg was mid-way through his PhD in chemistry when he decided he wanted to follow his calling and become a farmer (If you don't remember this story, click here to learn more. It's a good one!). His initial vision was a diversified organic vegetable and livestock farm. With this in mind, after graduating, he got started working on veggie farms right away. After a few years, when he felt like he had a solid foundation in veggie farming, he began learning more about raising livestock. 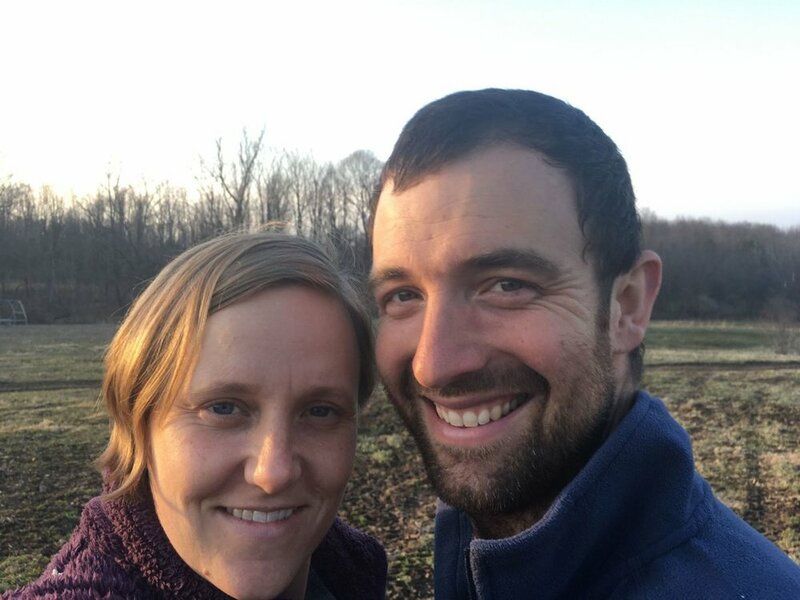 When we found our land here in Henrietta, Greg realized that livestock farming was not only what was best suited for our land, but it was really where his heart was. However, something about working in tilled soil, the colors and variation of vegetable production, kept pulling him back to wanting to grow produce. So, he made a new plan. Livestock we would be our focus, but we would choose one or two specialty produce crops to complement the healthy proteins we were growing. Now came the the tricky decision figuring out what plants to grow. Like the scientist that he is, Greg researched! We considered rhubarb, basil, sunflowers, ginseng, horseradish, lavender, until he eventually found some journal articles about growing ginger/turmeric in the northeast and something just clicked. Around this same time, a local farmer shared about his success with growing ginger alongside his beef/chicken/veggies, and this gave us the final push to dive in. While we absolutely love raising our animals, we are equally passionate about tending to these two incredible plants. They take FOREVER to grow and are very time-intensive to harvest (more on this process coming next week), but the final product is as extraordinary as anything we've ever grown and it keeps us coming back for more year after year. PS-In case you're wondering.... harvest starts in a few weeks. We will keep you posted when it's ready!